If your kids are anything like mine, the LOVE water. They love doing any type of activity in or near the water, whether it's jumping, diving, tubing, swimming, paddle boarding, boating, or playing on the dock or beach. The past couple years I've been capturing all this on film, and I've narrowed down my necessities have in my summertime camera bag at all times. 2. Underwater camera. I LOVE the perspective from shooting right there in the water with your kids! This year I upgraded to the Nikons V, a Nikon 35mm underwater camera and I can't wait to give you a report on how it handles. You can find them relatively cheap on Ebay. If it isn't in your budget this year, spring $8 for an underwater disposable camera, found at any drug store. These images are all taken with a disposable and I love their vibe! 3. Lots of film, duh. :) My top 3 film choices are Ektar, Portra 400, and Kodak BW400CN. Ektar is perfect for those bright sunny days. It's a 100 speed film that packs a lot of color punch, and it screams summertime. If you want something more subdued, read on. My second favorite is Portra 400, due to its versatility. I can rate it at 400 and be able to take useable photos in full sun, overcast, golden hour, and even at sunset. I've used a lot of Portra 160 and Fuji 400h and they work well during the day, but aren't as versatile in the evenings. My favorite b/w film last year was Tri-x. It's extremely versatile too. But I didn't like the grain of it as much in 35mm format. (I will be playing with a lot of HP5 this summer.) If you don't want to get a true black and white, go for Kodak BW400CN. It's developed with C-41 (color developer) and looks beautiful, and you expose it just like you expose color film (this is a great option if you don't have a spot meter), and has less grain than Tri-x. 4. Light meter. I use a Sekonic-358 and it works great. I use the meter mostly for very sunny mid-day backlit photos, as I find the in camera meter has the most trouble with this type of lighting. 5. Notepad. I like to experiment with all films in a variety of settings and lighting conditions. If its new or tricky, or I'm rating a film differently, I will still take notes so I can refer back to them and learn something new. 6. Sunscreen and lip balm is a must! 7. Zip-lock bag for your film and phone. I've learned the hard way. 8. I pack all of this in my more rugged Tamarac camera backpack. The padded inside gives me many options for fitting in the gear I choose to bring. The padded straps are comfortable, and all areas zip up securely which helps keep sand or water from ruining anything. If you have more summertime tips that you've found helpful, please share! Lopez Island is the largest island in the San Juans, located northwest of Washington's mainland, and ironically, northeast of Vancouver Island, Canada. It's known for its gentle rolling hills and open fields, making it a popular destination for bike riders who tour around all the islands. We got to spend spring break here with friends in a quaint little cabin free of wifi and cellular access. This seems alarming to many at first, but I can assure you, after you're out of range the first day or two, your whole body will relax and your mind will clear of your to-do list to instead focus on the beauty around you. This serene countryside is an hour and a half drive north from Seattle to Anacortes, followed by an hour ferry-ride. We spent our week visiting many beaches and inspecting tide pools, collecting sea glass, riding bikes, going on walks, hiking to a secret mountaintop rope swing, and just hanging out at the cabin. It was the perfect antidote to the busy life we lead. You can see even more photos from our trip here. It’s true, I just returned from India, where many go to seek enlightenment. I however, was not in search of enlightenment, I was in search of stories, photographs and let’s be honest, to survive, to thrive, to see, experience and eat all that I could during our two year assignment there. And I did, but India has a way of helping you locate yourself when you didn’t know you were lost. It’s just like everything about your normal life, only, amplified by ten million or so. Once you’ve seen India, you can never unsee it. I’d never want to, but it sure would hurt less if I could. As photographers, our brains have been hardwired to form frames around everything we see. To snapshot it and to file it away and I’m not just talking about the photographs you actually take. I think as a photographer you take many, many more photographs than the ones you actually take. They are often the ones that haunt you for better or worse. The ones you wished you’d taken, the ones you wish you’d waited a few more minutes for, the ones that wake you up at night with wonder and fear and sadness. I’ve come to believe it’s the same for photographers everywhere. It’s not just India. This isn’t really about India it’s about life, I’ve just come to understand life a little more clearly because of that place. With any job comes tension, with a job that requires cat-like reflexes, an eye trained like a sniper to see each and every flinch of a muscle, everywhere, whilst carrying in the neighborhood of 20lbs of gear, your business is going to be in knots. Mine was. About a year into our stay in India, I got really sick, no one really knew what was wrong and the symptoms of stress and the anxiety of not knowing what was wrong in a place where healthcare can be a concern, was enough to tip the scales of my body’s limits. I have practiced yoga for years off and on, “I came for the Shivasina” style. When I arrived in India I thought I wanted to be more serious about yoga, so I researched a few schools of yoga and purchased a year membership to a yoga studio near my house as a way to ease myself in to yoga in the birthplace of yoga. I awoke at 5:00am each morning for a few months and headed out to join the rest of Chennai in the thick morning air. I learned so much about yoga, the real yoga, not yoga as we know it in America, I learned so much that it damn-near scared me away from yoga altogether. Lesson 1: If it scares the crap out of you, do it again and again. Lesson 2: Find balance in all things. A dear friend of mine introduced me to YogaGlo. This could be any yoga website, class or school, but for me the ability to be alone (in a country of 1.3 billion this was paramount), at home, at a time when the kids were napping (or not) and I could stretch my body and spirit was ideal. I fell in love. I’ve even begun to make peace with my body after three babies. I have. I’ve been able to step away and I mean really away from my work, not just turn away to my phone or my Facebook page, I mean get away from it all for an hour or 90 minutes and when I stop thinking about whatever it is that’s weighing on my mind, I figure it out. I have had the greatest inspirations, ideas and bits of writing come to me when I’m upside down that I have to unroll myself and write it down. Somewhere in all the inspiration and the slow but steady healing of my body, I became stronger and I’ve surprised myself in many ways. I’ve slept better; I’m more patient with my family and with my work. Kids don’t grow up easily; every day isn’t a picnic at the park and snuggles in bed. Your business doesn’t grow overnight, it is a garden that you sow and water and that you walk away from and you let your hard work marinate while you grow and do other things in your day and your life and when you come back, you guys, you’ve got plants! You’ve got fruit, you’ve got teenagers and ten years of marriage under your belt and you’ve got a few things published and you’ve landed your first big deal client. It will happen. I’m sure it will happen either way, if you work hard, but knowing what I know now, I’d like it to happen while I enjoy the other bits of life more fully, breathing deeply, worrying less, standing taller and stronger. The wind will blow, there will be a storm, but I know now because of yoga that I’ll survive and I’ve built up the patience and strength to weather it. Lesson 4: Do yoga again and again. I no longer have any numbness in my hands at night, I don’t have shoulder pain and my core is stronger than it ever was, alleviating all the back pain that accompanied trekking about India with my trusty bag of cameras. I can’t say there is any one posture that achieved this, there simply isn’t, there also isn’t any one recipe to success only dedication and commitment. 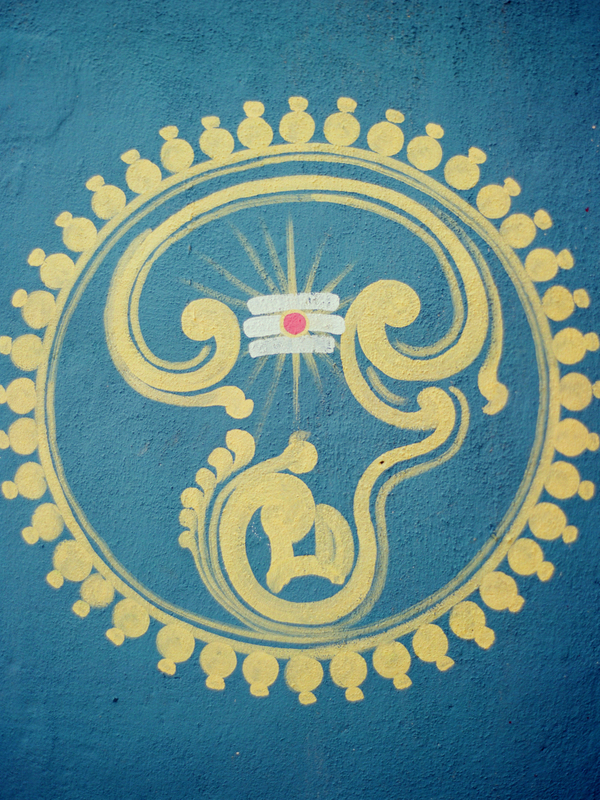 This is a Tamil Om Symbol. Tamil is the native language of South India's Southern-most State of Tamil Nadu and home of Chennai, where I resided for the past two years. Tamil is one of the longest surviving classical languages in the world. Now you can’t say you don’t know where to start. Happy heart opening, pain-free shooting and peaceful road to your inevitable success. Traviling with film can be an ordeal! Film cameras are heavy, and packing film in and out of airports is not always convenient. But holy moly, are the results worth it! Check out these gorgeous images by Michelle Lemay! The make me want to pack up and go to Portugal! These images are from my trip to Portugal this summer. I selected photos from only Evora and Arriolos, two inland towns. We also visited and loved Lisbon and Comporta during this trip, but these places had such a specific and unique feel to them, I thought they stood best alone. Both Evora and Arriolos are sun-baked, sleepy communities where little English is spoken and you really feel you’ve stepped out of your life into another world. It was 110 degrees fahrenheit during our stay, and the white hot, baking streets were utterly deserted during daylight hours. Only as the sun dipped low in the sky did the Portuguese emerge and start walking their dogs and doing their shopping. I shot these on my pentax 645nii with fuji 400h. Scans are by Photovision. Hello! Me again, with the next installment of “Shooting Film in India.” When we last met, I had just moved my family to India and my rolls of 35mm and 120mm film were vying with dosa mix for space in my refrigerator. Frustrated, on the verge of throwing in the towel, and standing outside the door of of my very own make-believe, fantasy darkroom, three small children pounding to get in, I awoke in a cold sweat. My exposed film was backing up. I had to do something with it. Shortly after my arrival in India, I joined a group called “Film India” on Facebook and Googled the life out of “Film, Chennai, Camera, Help, Someone, Save, Me.” After making acquaintances with some great people in (and out of) the area, I was finally directed to a gentleman who had once owned a popular camera store in Chennai. So I did what any film lover might do…I went straight to that strange man’s apartment across town. With my driver in tow, we knocked on the apartment door. When the gentleman opened the door, he immediately embraced my driver. Already convinced that Chennai was the friendliest place on earth, I thought nothing of it. I would later learn that as a young man, Sundar, our driver, had driven for the gentleman and his seven brothers and sisters as children. In safe hands, I entered, sat, took tea, juice, water and biscuits, exchanged pleasantries, as well as the names and professions of my husband and father, and received a wedding invitation to his daughter’s wedding, then the film, of course, and a promise to return weeks later. My rolls returned from Mumbai via a courier and a little Indian magic several weeks later. I raced home in Chennai’s sweltering mid-day traffic, dodging rickshaws and cattle, and back to my computer with a CD and an envelope of negatives to see the results. They weren’t bad, but at well over $20 a roll, it turned out it wasn’t worth the time saved. I also sent a few rolls to two local pharmacy-style Konica labs in Chennai. The results were much worse: The first lab sent back negatives that looked to have been scanned by a cat with very sharp claws. And the second? A CD of scans that were embedded within 65 hidden folders like Russian nesting dolls. I rang my friends at The FIND Lab. I purchased two Domke lead bags, and the lab arranged to have them sent back upon arrival, thus creating a constant circuit of film from Chennai to Utah and back. I’d save up a gallon zip-lock bag’s worth of film and send it out to be developed every three months or so. FEDEX wasn’t cheap, but there seemed to be a steady stream of friends and colleagues headed to the States that were willing to drop a box at USPS when they touched down. Thus, the cost stayed low and my inbox full of Christmas-like joy when scans arrived. Next time I’ll be talking about what’s in my bag and a typical day shooting in Chennai. If you have questions please leave them in the comments below and I’ll try to address them in subsequent posts! Get out there and shoot! Our 5 Favorite Holiday Cocktails! Tis' the season! Time for holiday parties and Christmas cheer! Are you planning any festive events this week? If so, we want to help. Today, Meghan and I are sharing some of our favorite holiday cocktails. We hope you enjoy! Perhaps my most favorite holiday cocktail is this cranberry margarita. For starters, it's beautiful. And with all of those fresh cranberries, it's practically health food. It's also super easy to make in large batches, making it the perfect signature cocktail for your party. Cheater eggnog! Sign me up! I love this recipe over ice, but have also had it steamed and served with a dash of cinnamon on top! Either way is delicious and festive! No holiday party is complete without a classic martini. Elegant and tasty! I always feel fancy when drinking one of these. What's a holiday celebration without bubbly? And since it's citrus season, blood oranges are so easy to find and have amazing flavor. I get tired of regular old mimosas (ok, i could still drink them all day long), and it's good to change things up. Try these Blood Orange Mimosas. The touch or triple sec really brings out the flavor. I don't know about you, but Christmas Brunch is a favorite of mine. Anytime I can eat breakfast food throughout the day works for me! And I can't think about brunch without Bloody Mary's. Here in Maryland, adding Old Bay crab seasoning is a must. And here's a tip, you can find a good bloody mary mix like Zing Zang (THE best) and save yourself a few minutes. You can also add other things as you like like pickles or olives. I like a more traditional bloody myself, but you can't go wrong adding more things to your taste. Also, use citron vodka or pepper vodka for extra flavor! Well hopefully this can get you off to a nice jolly start to Christmas week! Hello! I’m Elise Hanna. I just returned to the U.S. from two years abroad, living and working in Chennai, formerly Madras, the capital of India’s southernmost state, Tamil Nadu. I am a photographer, a traveler, a mother of three, and lover of film. I am the wife of a diplomat (a la Julia Child) and I’ve been an artist my whole life. After the birth of our daughter, Clementine, in Brazil, I hesitated to shoot anything, because shooting meant editing, and editing meant time away from my family. As an artist, a mom, and a perfectionist, the “endless possibilities,” of working in digital format was too large of a parameter for me to work within. I wanted to get my photographs just right, simply, and right out of the camera. Most of all, I wanted to love the process again. I scaled back my editing to one-click VSCO film emulations. I modified my shooting further to get it right with just one shot and then I began to wonder why I needed the Canon 5D Mark III I possessed at the time at all. I had shot film in my adolescence and was intrigued by the simple beauty film provided, but I needed a push off the cliff to set me free of digital distractions. I got that push at Jon Canlas’ FIND Workshop in May, 2013. Since then, I’ve never looked back. I attended the workshop with a thirst for knowledge and left with a family of like-minded film lovers that became my support system from across oceans. For the past two years, I’ve shot film nearly exclusively. Despite moving to India, I decided to continue to shoot film, because I had finally found my groove. I had begun to love photography again and seeing through the lens of my film cameras, namely the Contax 645, was like putting on a pair of glasses after not seeing clearly for my entire life. I also figured while a million photographers have laid their lenses upon India, I had an opportunity to shoot India in a new and different way. While it may seem a little nutty to have lugged the Contax about the streets of Chennai, I don’t regret it for a second, and the portfolio I created yields a softness about a city that at first glance seems deserted and dirty and that one only comes to know after falling in love with Chennai. The Contax isn’t just for hazy afternoon weddings in the California countryside; it lent compassion to the often over-dramatized grit of India. But shooting film in India certainly wasn’t without its challenges or its costs. Upon my arrival, I searched for labs in Chennai that would develop medium format film and discovered that only 35mm color was being processed and in “pharmacy” quality labs with the same quality results. With labs popping up in the U.S. and throughout Europe, I found that labs in India were swiftly closing down. I hunted high and low, I found myself at tea in the homes of complete strangers, discussing the possibility of shipping film via courier to other cities within India. I even once found myself at the top of a terrace at “The Camera House”, on the verge of being swallowed by an immense collection of antique cameras and being swarmed by the entirety of Chennai’s wild parakeet population simultaneously. A story for another time. People questioned my ability to continue to shoot film, and India challenged it, but film and its incredible, faithful, and passionate family reigned supreme. I'll be back soon with more tips and tricks for shooting film in India, how and where I developed it and how it made it's long journey back to the U.S.A. Until then, for more photographs from India, recipes and travel guides, please visit my blog. All images with captured on a Pentax 67 with Portra 400 by Sandra Coan. I was introduced to Old Fashioned's last winter when in the south. I have never ever been a whiskey, bourbon, or brown liquor person at all. One sniff and my entire body would burn. But I was cold, and at a social event and someone suggested trying one. One sip and I was hooked. And one drink and I was warm (and nearly buzzed). Now that it's winter again, it's the perfect cocktail. And what better way to intro our first Little Bellows Happy Hour post!! It's Friday, and I don't know about you, but my week was LOOOOOONG. And well, it's 5:00 on the East coast, so why the hell not make us some cocktails! Here's how I make my old fashioned's at home. They never are quite as good as when someone else makes them, but for me, this comes a close second. Cheers!! In old-fashioned glass, place sugar cube and cover with bitters and a small splash of water (only enough to cover the sugar cube). Muddle the cube until completely crushed. Add enough ice to fill glass. Squeeze orange peel over glass and add whiskey. Stir until cold, about a dozen times. Garnish with cherry (or two if you love them as much as I do. ENJOY!